The grocer is trouncing the market so far in 2014, but still has room to run. Consumers are gaining confidence, and so are Kroger (NYSE:KR) stock investors. While benefiting from their company's double-digit sales growth, shareholders have trounced the market so far in 2014 with an almost 30% gain. KR Total Return Price data by YCharts. 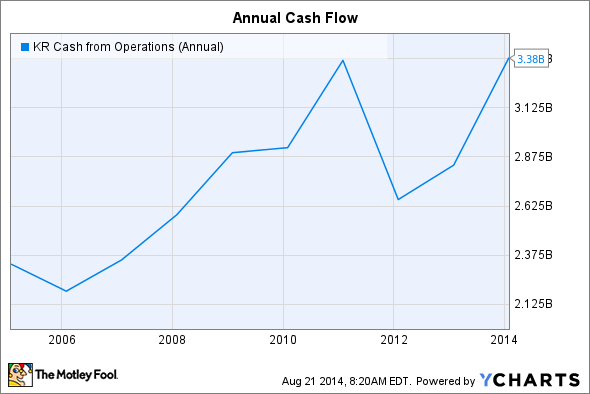 But the big question is: Can Kroger keep outgrowing competitors and the market from here? Let's take a look at three reasons why the grocer might continue its winning ways in the years ahead. Aiming for a foothold in fast-growing vacation and college-town markets, particularly in the Southeast U.S., Kroger spent over $2 billion to purchase its former competitor Harris Teeter in a deal that closed early this year. Sure, the prize was small in terms of revenue: Teeter's $4.5 billion in annual sales amounts to less than 5% of Kroger's massive $100 billion base. But shareholders are seeing benefits to the merger that go beyond just a modest sales bump. For one, the companies are reaping savings from increased scale that's helping them cut millions of dollars of distribution and labor costs. And those savings have helped upgrade Kroger's earnings this year. While management has targeted long-term profit growth of between 8% and 11%, it is on track to deliver between 12% and 15% in 2014 thanks mainly to merger synergies. Gains beyond that are harder to quantify, but here's one promising candidate: Harris Teeter has had success with its online ordering and store pickup model, which may be the kind of thing that Kroger could scale to its own locations. Kroger last quarter accomplished the surprising feat of actually outgrowing Whole Foods Market. It posted a 4.6% bounce in same-store sales, as compared to the organic giant's 3.9%. Yes, that favorable matchup was mostly due to a drop in Whole Foods' growth from its more usual 7% comps. 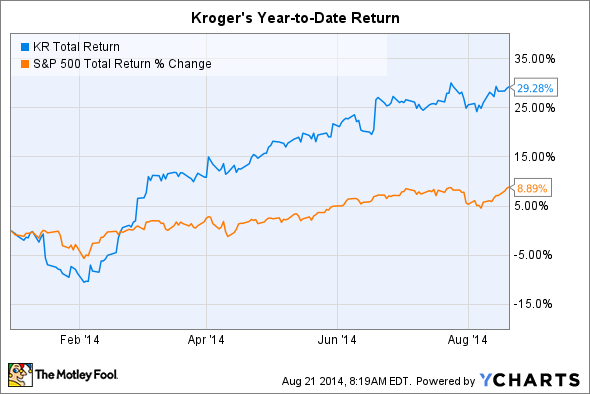 But it still shows that Kroger isn't too big to achieve head-turning growth of its own. In fact, like Whole Foods, the grocer is taking full advantage of the trend toward healthier eating, as illustrated by the double-digit sales increase that its natural and organic foods department posted last quarter. There should be plenty of expansion ahead for those categories, which will lift profits and is likely one reason why Kroger boosted its full-year sales growth guidance to as high as 4% on a same-store basis. Finally, Kroger's capital return program is massive, and could accelerate shareholder gains in the years ahead. Consider that the company spent nearly $2 billion on buybacks and dividends just in the last four quarters, helping push its outstanding share count lower by 3%. Given Kroger's short-term goal to pay down its debt, investors shouldn't expect much more in the way of share repurchases this year. However, with annual operating cash flow near an all-time high of $3.4 billion, the company should have plenty of ammunition to fund both debt repayments and an increase in dividends and share buybacks over the next few years. KR Cash from Operations (Annual) data by YCharts. One big risk to watch for is a slowing economic rebound that would sap the energy out of Kroger's growth. But the good news for shareholders is that things aren't looking bad on that score. CEO Rodney McMullen told investors in a recent conference call, "We are seeing strong positive indicators in shopping behavior." Kroger's customers are being less cautious in their spending, which bodes well for the company's opportunity to keep extending its streak of same-store sales growth that now sits at 42 quarters straight.